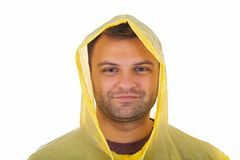 3,558 yellow raincoat stock images are available royalty-free. 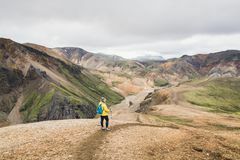 Woman in yellow raincoat hiking in the colourful mountains in Landmannalaugar national park, Iceland. 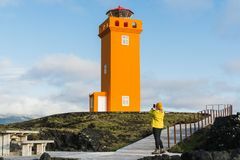 Woman in yellow raincoat hiking uphill in the colourful SNAEFELLSNES,Woman in yellow raincoat taking picture of Svortuloft Lighthouse, Snaefellsnes peninsula, Iceland. 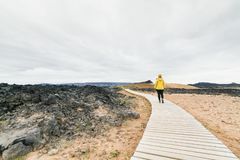 Woman in yellow raincoat walking in Krafla volcano lava field around Leirhnjukur mountain peak, Iceland. 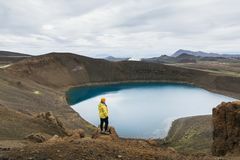 Woman in yellow raincoat standing in the crater of Krafla volcano, Iceland. 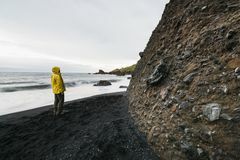 Woman in yellow raincoat standing in the water filled crater of Krafla volcano Young woman in a yellow raincoat standing on the black lava sand beach in Vik, Iceland. Composite image of woman in yellow raincoat holding an watering can. 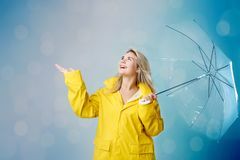 Woman in yellow raincoat holding an watering can against abstract blue background Composite image of woman in yellow raincoat holding an umbrella. Woman in yellow raincoat holding an umbrella against row of trees in park Girl in yellow raincoat. Studio portrait of teenage girl wearing yellow raincoat and holding open colorful umbrella isolated on white Women wearing yellow raincoat while raining in rainy season. 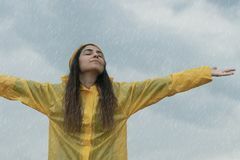 Portrait of the woman wearing yellow raincoat while raining in rainy season Girl in yellow raincoat. 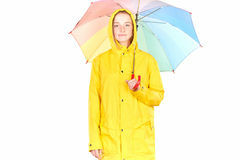 Studio portrait of teenage girl wearing yellow raincoat and holding open colorful umbrella isolated on white Yellow raincoat. 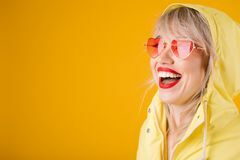 Happy laughing woman on yellow background witn pink heart shaped sunglasses. Bright emotions. Yellow raincoat. 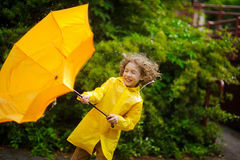 Happy laughing woman on yellow The boy in a bright yellow raincoat with effort holds an umbrella from wind. Strong wind pulls out a yellow umbrella from his hands. 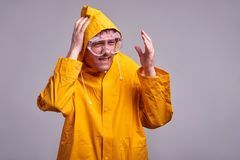 Wind has disheveled hair Woman in yellow raincoat standing In the ocean. 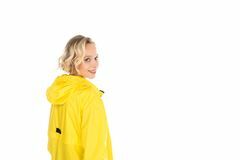 Woman Looks Over The Ocean On A Windy Beach Wearing A Yellow Raincoat Side view of cheerful young woman in yellow raincoat running with spread arms looking at camera. 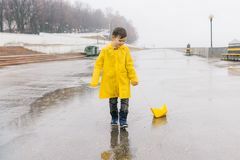 Full body length portrait isolated over gray studio background A boy in a yellow raincoat plays a large paper boat in a puddle. A toy. Yellow paper boat on a string. 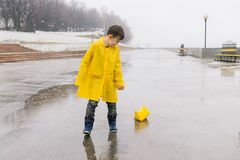 Embankment, street, outdoors, walk A boy in a yellow raincoat plays a large paper boat in a puddle. A toy. Yellow paper boat on a string. Embankment, street, outdoors, walk A boy in a yellow raincoat plays a large paper boat in a puddle. A toy. Yellow paper boat on a string. Embankment, street, outdoors, walk Men in yellow raincoat on the beach over the stormy sea holding a cup of hot tea. 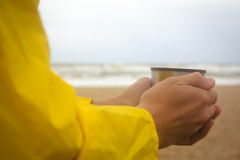 Men in yellow raincoat on the beach over the stormy sea holding a cup of hot Young man wearing a yellow raincoat. 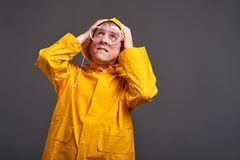 Picture of a caucasian young man wearing a yellow raincoat, posing on isolated background Woman in a yellow raincoat on a gray background. 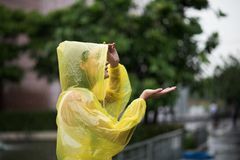 Blonde woman wearing yellow raincoat holding transparent umbrella checking weather if it is raining. 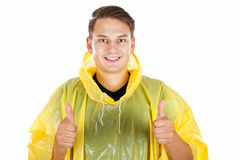 Protected Young man wearing a yellow raincoat, showing thumbs up. Picture of a young man wearing a yellow raincoat, showing thumbs up on isolated background Excited young trendy woman in yellow raincoat. 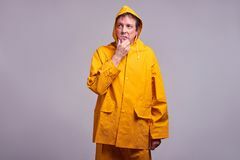 Full body length portrait isolated over gray studio background Man in a yellow raincoat on tropical seashore during rain. He is thinking about something in loneliness Attractive woman wearing yellow raincoat - isolated. 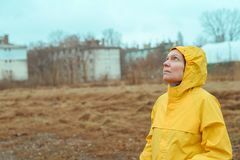 Picture of attractive caucasian woman wearing a yellow raincoat, posing on isolated background Attractive woman wearing yellow raincoat - isolated. 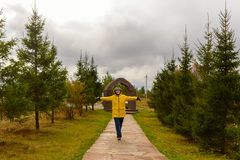 Picture of attractive caucasian woman wearing a yellow raincoat, posing on isolated background Attractive woman wearing yellow raincoat - isolated. Picture of attractive caucasian woman wearing a yellow raincoat, posing on isolated background Man in yellow raincoat. 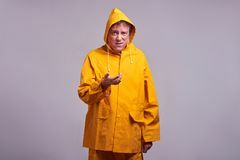 A middle aged man standing and thinking in a yellow raincoat r Man in yellow raincoat. 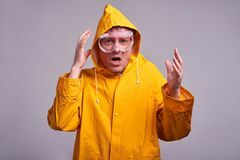 A middle aged man in a yellow raincoat and safety glasses feeling scaredr Man in yellow raincoat. 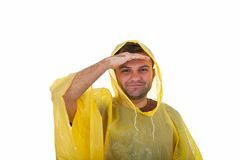 A serious middle aged man standing in a yellow raincoat and pointing in to the camerar Adorable little girl in yellow raincoat. With maple leaves Caucasian woman with balloons wearing yellow raincoat. Smiling young Caucasian woman with balloons wearing yellow raincoat on yellow background A pretty young woman in a yellow raincoat. 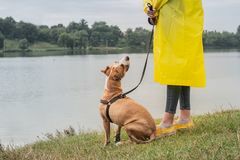 A pretty young woman, isolated against a white background, wears a yellow raincoat, waiting for it to rain Walking the dog in yellow raincoat on rainy day. 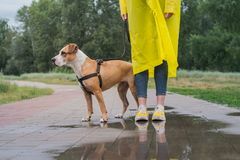 Female person a. Nd staffordshire terrier dog on a leash stand on pavement with puddles in urban park in bad Man in yellow raincoat. 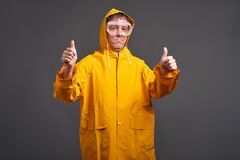 A confident middle aged man in a yellow raincoat and safety glasses showing thumbs upr Man in yellow raincoat. 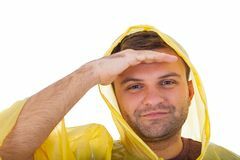 A middle aged man standing and thinking in a yellow raincoat r Man in yellow raincoat. 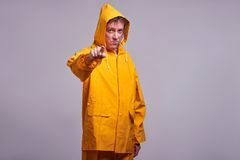 A serious middle aged man standing in a yellow raincoat and pointing in to the camerar Man in yellow raincoat. 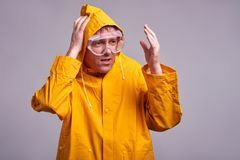 A middle aged man in a yellow raincoat and safety glasses feeling frightenedr Man in yellow raincoat. 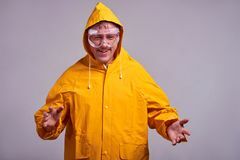 A middle aged man in a yellow raincoat and safety glasses feeling frightenedr Mature man in a yellow raincoat. Full length portrait of a mature man in a yellow raincoat isolated on white background Back view of beautiful young woman in yellow raincoat. Isolated on white Young woman in a yellow raincoat walking along the path in the Park in cloudy weather with his hands in the rain rejoices, copy. Young woman in a yellow raincoat Little fellow in a bright yellow raincoat flies over the earth with an umbrella in hand. 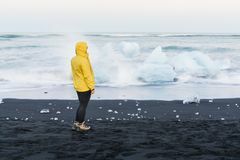 Little fellow in a bright yellow raincoat flies over the earth with an Woman in yellow raincoat standing next to icebergs in arctic ocean which drifted out of Jokulsarlon lagoon, Iceland. Woman in yellow raincoat. A pretty young woman in a yellow raincoat, isolated on white Man in yellow raincoat. 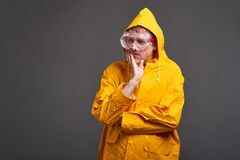 A middle aged man standing and thinking in a yellow raincoat r Man in yellow raincoat. 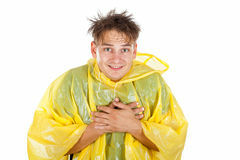 A middle aged man in a yellow raincoat and safety glasses feeling happy and laughingr Man in yellow raincoat. A middle aged man in a yellow raincoat and safety glasses feeling frightenedr Woman in yellow raincoat texting on mobile phone outdoors. 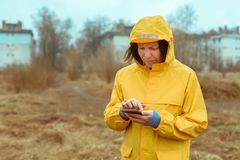 On rainy day Sad woman in yellow raincoat talking on mobile phone. Out on the street while it`s raining Woman in yellow raincoat looking up at rainy clouds. While the raindrops are falling on her face Portrait of woman wearing a yellow raincoat. 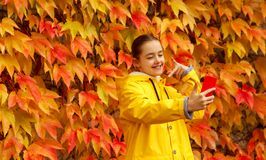 Having a fun on the beach Beautiful little girl in yellow raincoat takes selfie at bright autumn leaves background. Beautiful smiling preteen girl in yellow raincoat taking selfie by Young man wearing a yellow raincoat. Picture of a caucasian young man wearing a yellow raincoat, posing on isolated background Young man wearing a yellow raincoat. Picture of a caucasian young man wearing a yellow raincoat, posing on isolated background Young man wearing a yellow raincoat. Picture of a caucasian young man wearing a yellow raincoat, posing on isolated background Young man wearing a yellow raincoat. Picture of a caucasian young man wearing a yellow raincoat, posing on isolated background Young man wearing a yellow raincoat. Picture of a caucasian young man wearing a yellow raincoat, posing on isolated background Happy girl in a yellow raincoat. Standing on the pavement of old city. Posing on camera Fisherman in a yellow raincoat holding a portable freezer and a fishing rod. 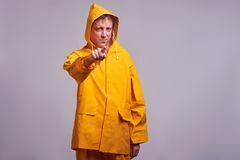 Full length portrait of a fisherman in a yellow raincoat holding a portable freezer Composite image of woman in yellow raincoat holding an watering can. Woman in yellow raincoat holding an watering can against abstract yellow background A girl in a yellow raincoat walking in the forest. A girl in a yellow raincoat and pink hat walking in the forest A girl in a yellow raincoat walking in the forest. 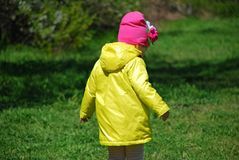 A girl in a yellow raincoat and pink hat walking in the forest A girl in a yellow raincoat walking in the forest. 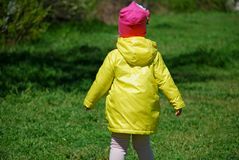 A girl in a yellow raincoat and pink hat walking in the forest Yellow raincoat hanging on a metal wall, Marine background, protective clothing for rainy days. A yellow raincoat hanging on a metal wall, Marine background Woman wearing yellow raincoat out in the rain. Girl in yellow raincoat writing the word Iceland on the sand of Skardsvik beach at sunset, Snaefellsnes peninsula. 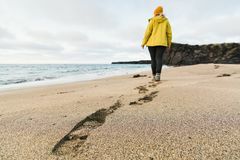 Iceland Girl in yellow raincoat walking on the sand of Skardsvik beach at sunset, Snaefellsnes peninsula, Iceland. Girl in yellow raincoat walking on the sand of Girl in yellow raincoat walking on the sand of Skardsvik beach at sunset, Snaefellsnes peninsula, Iceland. 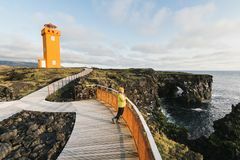 Girl in yellow raincoat walking on the sand of SNAEFELLSNES,Woman in yellow raincoat watching sunset at Svortuloft Lighthouse, Snaefellsnes peninsula, Iceland. ICELAND - AUGUST 2018: woman in yellow SNAEFELLSNES,Woman in yellow raincoat taking picture of Svortuloft Lighthouse, Snaefellsnes peninsula, Iceland. 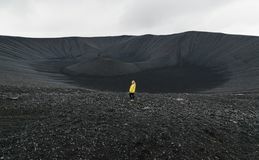 Young woman in yellow raincoat standing in the crater of Hverfjall volcano in Myvatn area, Iceland. 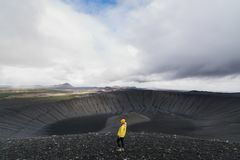 Young woman in yellow raincoat standing in the crater of Hverfjall volcano in Myvatn area, Iceland. 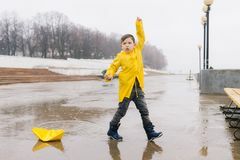 Preschooler child in rubber boots, yellow raincoat with umbrella,. Isolated on white Woman in yellow raincoat and shoes walks the dog in rain at urban park near lake. 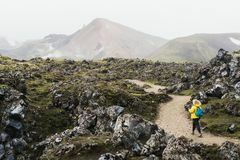 Young female person and pitbull terrier puppy s. Tand in bad weather near river Woman in yellow raincoat walking through the lava field towards foggy mountains in Landmannalaugar national park, Iceland. 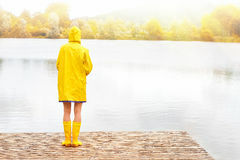 Young woman in yellow raincoat and rubber boots. 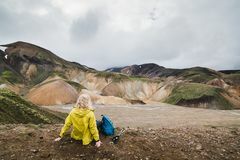 Standing on lake in autumn Woman in yellow raincoat overlooking the colourful mountains in Landmannalaugar national park, Iceland. 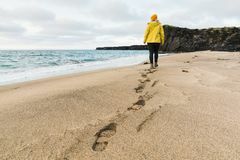 Woman wearing a yellow raincoat on the beach. Portrait of woman wearing a yellow raincoat having a fun on the beach Woman wearing a yellow raincoat on the beach. Woman wearing a yellow raincoat standing in the beach and gazing towards horizon. Leisure and freedom concept Portrait of a teen guy in a yellow raincoat brunette in the studio.